Hasbro continues its new line of Star Wars Mighty Muggs with a wave of figures based on the upcoming film, Solo: A Star Wars Story! 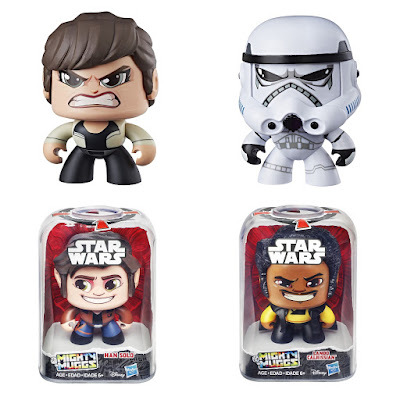 These newly redesigned Star Wars Mighty Muggs stand 3.75” tall and feature a really cool head-turning super power that lets fans experience a different side (or sides) of their favorite Star Wars characters. The Solo: A Star Wars Story Mighty Muggs Collection includes Han Solo, Lando Calrissian, Qi’ra and a Stormtrooper. Each hyper-stylized Mighty Muggs figure feature a push-and-turn mechanism that lets fans change the figure’s facial expression by pushing down on the head. With 3 different expressions and classic character designs, these figures will have fans doing a triple take! Fans can pre-order all four Solo Mighty Muggs individually now at Entertainment Earth for just $10.99, or you can purchase a complete wave of figures for $59.99 here.